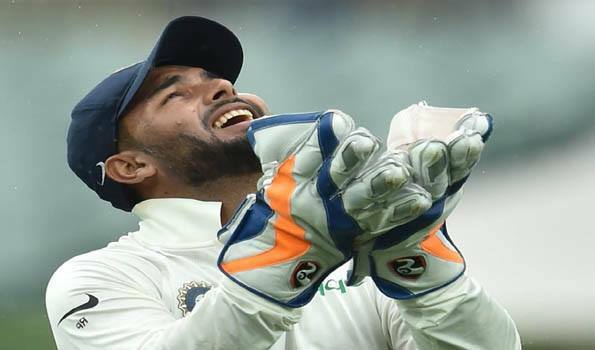 Dubai: Rishabh Pant has attained new highs for an India wicket-keeper batsman in the MRF Tyres ICC Test Player Rankings after his superb century in the drawn final Test in Sydney. The 21-year-old left-hander has gained 21 slots and reached 17th place, the joint-highest by a specialist India wicketkeeper along with Farokh Engineer, who did so in January 1973. Further, Pant's aggregate of 673 rating points are the highest by an India wicketkeeper, with Dhoni having the next highest aggregate of 662 points and Engineer 619 points. Dhoni's highest Test ranking was 19th. Pant, a star at the ICC U19 Cricket World Cup in 2016 when he scored an 18-ball half-century against Nepal, has moved into the top-20 after only his ninth Test match with an unbeaten 159. Pant had started the Australia tour in 59th place and made rapid progress, scoring 350 runs in a series that also saw him take 20 catches. Cheteshwar Pujara, who scored 521 runs to help beat Australia 2-1 and claim the Player of the Series award, is another batsman to gain in the latest rankings update, which also takes into account performances in the second Test between South Africa and Pakistan in Cape Town. Pujara has gained one slot to reach third position while all-rounder Ravindra Jadeja (up six places to 57th) and rookie opener Mayank Agarwal (up five places to 62nd) are the others from his team to advance at the end of a historic series win. Spinner Kuldeep Yadav has gained seven slots to reach a career-best 45th position after his figures of 5 for 99 in Australia's first innings even as Jasprit Bumrah has held on to 16th position and Mohammed Shami has gained one place to take the 22nd slot. Jadeja has gained one place to reach fifth among bowlers and has also leapfrogged Windies captain Jason Holder into second place among all-rounders.For Australia, opener Marcus Harris has advanced 21 places to take a career-best 69th position after a fine 79 in the first innings while off-spinner Nathan Lyon has inched up from 14th to 13th position. South Africa's Aiden Markram has moved back into the top 10 after his knock of 78 at Cape Town, gaining seven slots to reach 10th position. Temba Bavuma has moved into the top 30 for the first time (up five places to 26th) after his score of 75 while captain Faf du Plessis's first-innings century has lifted him six places to 16th position. Among their bowlers, Vernon Philander has gained one slot to reach third position while Duanne Olivier has continued his surge to move up to 32nd place from 36th.For Pakistan, Asad Shafiq has benefitted by five places to reach 24th position after scores of 20 and 88 while Babar Azam is only one slot behind after gaining two places. Shan Masood has moved up 22 places to a career-best 65th while captain Sarfaraz Ahmed has moved up from 42nd to 37th place.